Equine ophthalmology encompasses all the diseases and conditions affecting horses’ eyes. Common diseases include superficial corneal ulcers, uveitis and penetrating corneal lacerations. Common clinical signs of superficial corneal ulcers include epiphoria (tearing), photophobia (squinting), swollen eyelids and/or changes in color and appearance of the corneathe transparent layer forming the front of the eye.. It often develops after something (fly mask, hay, mangers, etc.) has scratched or disrupted the outer layer of the cornea (clear part of the eye) known as the epithelium. Corneal ulcers are prone to infection and are painful, so generally treatment includes topical antibiotics, topical antifungals, topical atropinemedication used to treat certain types of nerve agent and pesticide poisonings or oral anti-inflammatories. Treatments may be administered topically with ointments or ophthalmic solutions using a subpalpebral lavage system (SPL). A subpalpebral lavage is a tube that is placed under the eyelid and extends to a port often tied to the horse’s mane to aid in treatment. Over time, horses may resent treatment, and the SPL makes treatment easier, especially if treatments are frequent or long-term. Sometimes fungi, commonly Aspergillus or Fusarium species, may colonize the affected ulcer and complicate and delay the healing process. This condition is called mycotic keratitis or keratomycosis. Fungal involvement is usually suspected when there is resistance to initial antibiotic therapy; it appears to be more painful than bacterial superficial corneal ulcers. Fungal keratitis looks much like superficial corneal ulcers but often has pathognomonic [DG1] lesions of focal yellow/white/green areas (often called satellite lesions) within the stroma [DG2] or at the inner endothelial [DG3] surface. Diagnosis may be made on history and clinical signs alone or supported by corneal cytology, which is the process of collecting a sample of cells and viewing them under a microscope. Treatment is similar to that of superficial corneal ulcers; however, topical or systemic antifungals are added as well as autologous serum to help with corneal “melting” (a phenomenon in which the cornea’s natural defense mechanisms start to auto-digest itself in cases of severe bacterial or fungal keratitis). Corneal ulcers should always be considered an emergency. If severe and left untreated, the infection could potentially lead to a ruptured eyeball. Considering the cornea is only about 0.8 to 1 mm thick, any missing layers could be vital. With prompt and aggressive treatment, most corneal ulcerations often carry excellent prognoses. 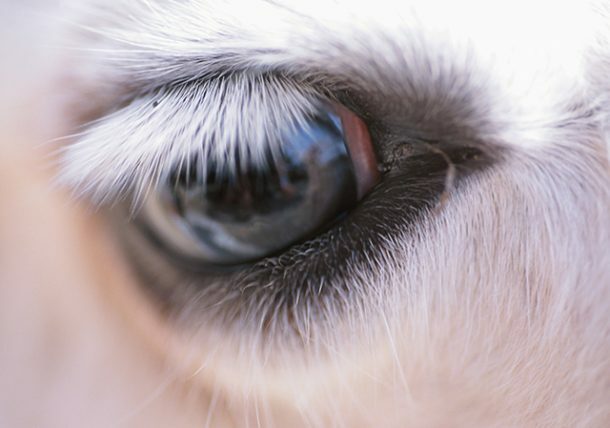 Another common equine ophthalmic disease is uveitis, often called “moon blindness.” It causes inflammation in the inner, vascular portions of the eye called the uvea. Common clinical signs are much like corneal ulcers (i.e., epiphoraoverflow of tears onto the face, photophobiaextreme sensitivity to light, swollen eyelids), except often cloudiness is diffusely present in the globe of the eye. Uveitis can affect one or both eyes and is a painful condition. If left untreated, uveitis may be sight-limiting and lead to loss of the eye. Common treatments and management include topical and oral anti-inflammatories, topical atropine and, when necessary, topical antibiotics or a cyclosporine implant. Uveitis, an immune-mediated disease, is typically a recurring and lifelong condition but often can be medically managed. With severe cases of uveitis, removing the eyeball or enucleation may be recommended as a last-resort treatment. Although removing the eyeball seems extreme, it is curative as the eyeball is the source of pain and inflammation. Equine recurrent uveitis carries a guarded prognosis and is the number one cause of blindness in the horse. The last common eye condition is penetrating corneal lacerations. Most often lacerations are due to a blow, like a kick or running into a fixed object. This is an immediate emergency and is most often referred to an ophthalmologist or a surgeon to achieve the best results. Clinical signs include a prolapsed iris, hyphema (blood inside of the globe), hypopyon (pus in the eye), photophobia, epiphoria, swollen eyelids, squinting and most often there is a defect on the cornea. Treatment is focused on decreasing further damage to the intraocular structures of the eye and repairing the integrity and pressure of the globe. Vision is assessed, and if the horse can see, the defect is often surgically repaired. After surgery, the lesion is treated aggressively, much like with a superficial corneal ulcer. Prognosis is dependent on the severity of the lesion, the depth of laceration and the extent of intraocular structures involved but generally is often guarded at best. In conclusion, if you notice any tearing, squinting or changes in appearance or color of the equine eye, promptly seek medical attention. Always treat ocular conditions as an emergency. Megan McCarthy, DVM, is a graduate of Texas A&M College of Veterinary Medicine who lives in Dallas/Fort Worth. Dr. McCarthy practices at North Texas Veterinary Clinic in Fort Worth.